An Italian painter, born in Florence, Uccello was notable for his pioneering work on visual perspective in art. Giorgio Vasari (1511 – 1574) wrote in his book Lives of the Artists that Uccello was obsessed by his interest in perspective and would stay up all night in his study trying to grasp the exact vanishing point. He used perspective in order to create a feeling of depth in his paintings and not, as his contemporaries, to narrate different or succeeding stories. Uccello worked in the Late Gothic tradition, and emphasized colour and pageantry rather than the Classical realism that other artists were pioneering. His style is best described as idiosyncratic, and he left no school of followers, though he had some influence on twentieth century art and literary criticism. He trained in the workshop of the sculptor, Lorenzo Ghiberti (1378 – 1455), where he started a life-long friendship with the influential Donatello (1386 – 1466). 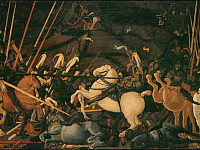 His masterwork, once called Battle of Sant’Egidio of 1416, but now known as, Battle of San Romano, is a triptych, now dispersed to the Uffizi Gallery, the National Gallery of London and the Louvre in Paris. 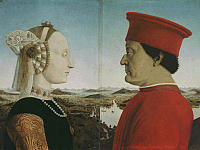 The works were once owned by Lorenzo the Magnificent of the Medici family (1449 – 1492). 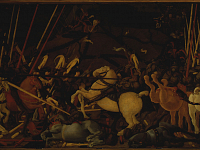 It depicts a 1432 battle between Florence and Siena, in which both sides claimed to be victorious; but at the center of the Uffizi panel, is the Florentine condottiero, Niccolò da Tolentino unseating the Sienese leader. Also in the Uffizi Gallery is his, Nativity and Annunciation to the Shepherds, a 1446 work from the hospital of San Martino alla Scala. Working mainly around Florence, he painted works for the church of Santa Trinita, the Santa Maria Maggiore, the Church of San Miniato, the church of Santa Maria Novella and the Duomo (Basilica di Santa Maria del Fiore). He then moved to Venice, working in the Basilica di San Marco, also in the Cathedral of Prato, in Bologna and later in Padua, then Urbino. It is said that he would also travel at the invitation of Donatello. Uccello even named his son, Donato, after the master sculptor. His last known painting is a famous piece, The Hunt in the Forest, from 1470. Uccello’s legacy, especially through his influence of perspective reached many great artists, including, Leonardo da Vinci (1452 – 1519), Albrecht Dürer (1471 – 1529) and Piero della Francesca (1412 – 1492). He also taught his daughter, Antonia (1446 – 1491) to paint and draw, but her work is not documented; only that she was a Carmelite nun.